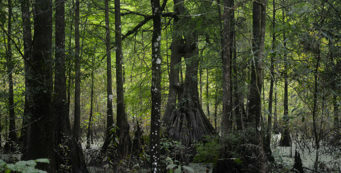 Florida Trail, Yates Marsh | Florida Hikes! 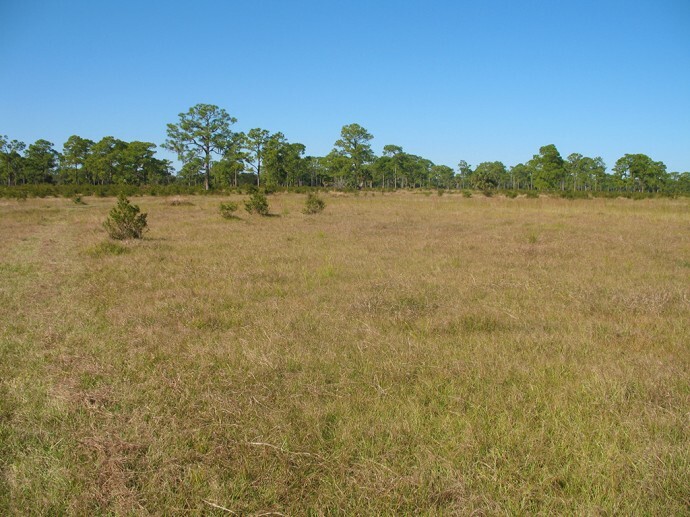 In the heart of the Kissimmee prairies, Yates Marsh is not so much a marsh as it is open pastureland edged with dense oak and palm hammocks and stretches of natural pine flatwoods. You never see the Kissimmee River as you zigzag between patches of shade along this section. For Florida Trail thru-hikers headed northbound, this is the first place for you to enjoy natural habitats – dry ones, even! – since leaving Big Cypress. Park either at Platts Bluff County Park (south end) or Yates Marsh trailhead (north end) to hike this section. Check in advance regards hunting seasons; wear a blaze orange vest or shirt if hiking during hunting season. 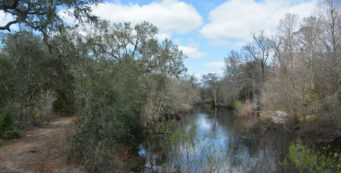 Starting from the shade of the live oak canopy at Platts Branch County Park, follow the orange blazes north along the dirt road that exits the park beyond the boat ramp. Walking past homes and mailboxes, you come to a yellow barrier you have to step over, and a stile leading into Yates Marsh WMA. For a thru-hiker, after a week or more of levees and roads, this expanse of tall longleaf pines and tall grass is bliss. The trail is out in the open, following blazed posts. As you get close to a dense line of pines, the trees sport orange blazes. 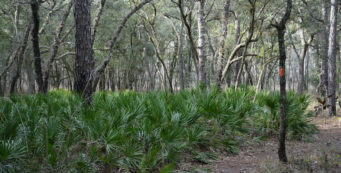 The trail crosses an old jeep road on a berm continues towards the pines, winding its way through stands of wax myrtle. Just past a pair of cabbage palms, the trail makes a sharp right into the shade, into an area that hogs may have torn apart. 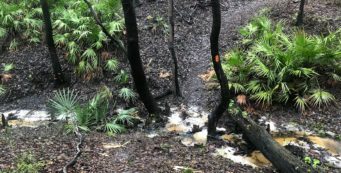 One of the reasons for so many hunting areas along the Kissimmee River basin is to wage war on wild hogs, descendents of Spanish livestock from centuries past, that tear the forest floors apart throughout this region. 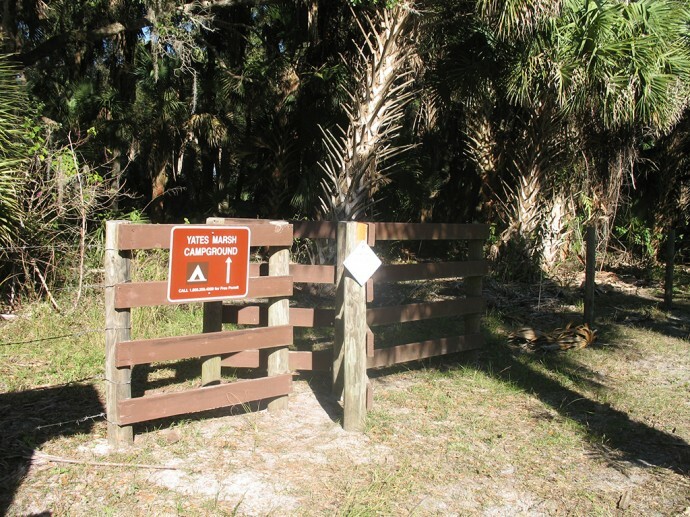 Following the trail between the young cabbage palms and the shade of the oaks, watch for a sign around 1.5 miles marking the turnoff to the right for the Yates Marsh campsite, which is off the main trail just 0.2 mile down a blue blaze. It’s worth making the side trip to sit at the picnic table in the shade of the oak hammock, even if you don’t plan to stay for long. A water pump along the side trail provides non-potable water. 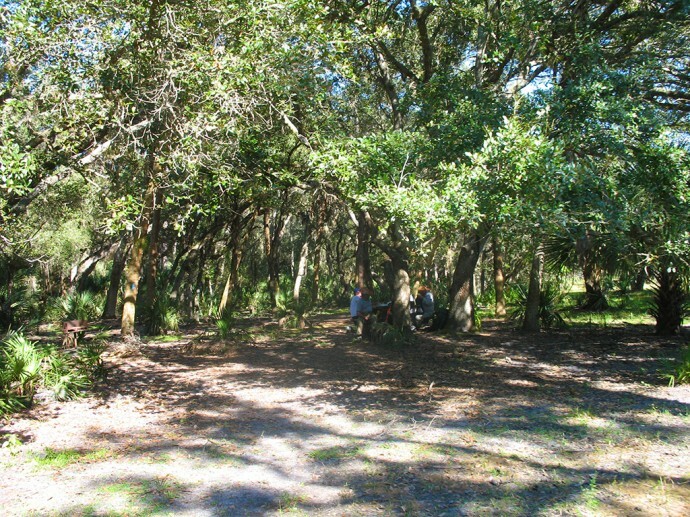 The campsite itself has a grill and a picnic bench, and nice camping spots beneath the oaks or out in the open prairie. Back on the main trail, you walk past a marsh with a fence to your right. If the pitcher pump isn’t working, there is a large water hole at a culvert, looking like a gator hole or cattle wallow. Stepping out into a broad open pasture, the trail continues straight ahead across it towards the far trees. You see a blaze on a cabbage palm to your right. At a double blaze, the trail turns away from the fence on to the left and leads you into the shade of the distant forest, still crossing the broad, open pasture with scattered cabbage palms. You enter an oak hammock under the limbs of a very large live oak. The trail makes an immediate jog to the left, down what appears to be a slightly raised berm under the oaks. Count to ten, and the trail turns right into a very dense palm hammock. As the trail emerges from the hammock, it jogs to the left. There is a marsh beyond a fenceline on the right, a prime spot for seeing caracara and sandhill cranes. Four cabbage palms rise through a grand old oak as the trail jogs to the right, skirts along the shade of the oaks, and faces straight ahead, pointed at a cell phone tower near what looks like a water control structure along the still-ditched Kissimmee River. The trail then makes an obvious bend to the right. After 2.5 miles, the trail passes through a gate and turns to the left to lead you to a short bridge over an ephemeral creek through the pasture. 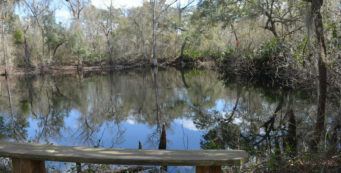 It then follows the bank of the creek on the west side, providing a clear view of the water structure on the Kissimmee River. Reaching a fenceline, the trail makes a sharp left to follow it northwest through more open pasture. You can see the cell phone tower over the lock on the Kissimmee River to the left. When the trail leaves the fenceline, it jogs to the left into the shade of oaks and palms in an oak hammock. American beautyberry grows throughout the understory of this particular hammock, and you can see tufts of wild pine bromeliads in the trees. There is a railroad track close by, close enough that if a train goes by you can certainly hear it pass. After 3.3 miles, you reach the gates marked “trailhead.” This is the primary trailhead for Yates Marsh, with a large parking area where a kiosk has a map that shows the route. Day hikers: You can turn around here for a 6.6-mile round-trip day hike, which can be done from either trailhead. Or spot two cars for the 3.3-mile linear hike. Thru and section hikers: the orange blazes of the Florida Trail exit along the entrance road, headed up a roadwalk connector to Chandler Slough East. 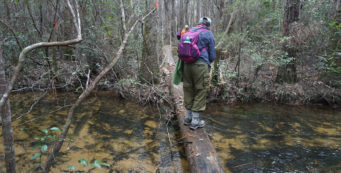 Cross an active railroad track at 4 miles, and watch for a stile on the left hand side of Loftin Rd to enter the next in-the-woods segment of the Florida Trail through Chandler Slough East. Thanks to Bryce Layman at Litepacker for his assistance in transcribing the field notes for this hike. Contact South Florida Water Management District. However, all of their lands are currently closed.